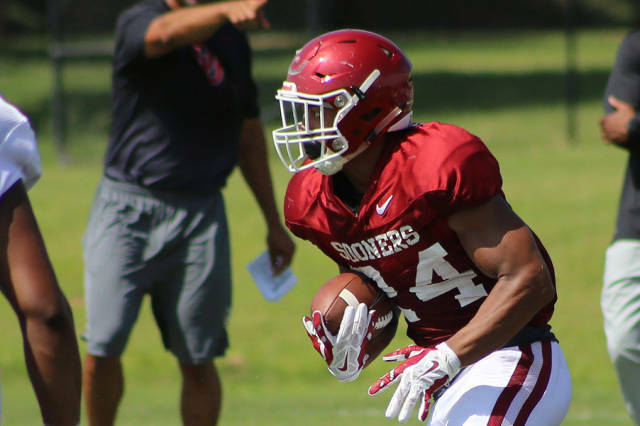 University of Oklahoma head football coach Bob Stoops announced Friday afternoon that redshirt freshman running back Rodney Anderson will miss the 2016 season due to a neck injury he sustained in Thursday's intrasquad scrimmage. "I hate it for Rodney," said Stoops. "It didn't appear to be much of an injury at the time and there's no paralysis or anything like that. But we found out this afternoon that he will be out for the year. Rodney is a strong guy and will rebound from this just like he came back after missing most of last season. He was practicing exceptionally well and had positioned himself to have a role in this year's offense." Anderson, from Katy, Texas, sustained a season-ending leg injury at Tennessee in last year's second game. He rushed one time on the season, picking up five yards in the opener against Akron. Anderson was a consensus four-star recruit coming out of Katy High School and was rated the No. 2 running back in the country by 247Sports after totaling 5,493 career rushing yards (9.1 per carry).